Among the very numerous record companies and their labels that have been active over the past several decades of sound recording, a very neglected area of research, apart from the actual collecting and preservation of disc records, cylinders and machines is that of the industry and output of the Orient and India in particular. Although it is generally known that most of the major record companies have been very active since the early years of sound recording in the Orient, for the most part nearly all of the companies in this field had only a short life-span in the industry. Even though the recording activities and’., output in the Orient of most of these record companies was usually an integral part of their ‘international’ output, very little documentation, let alone the discs and catalogues that they issued, has survived. A little known indigenous record label of India by the name of RAM-A-PHONE DISC RECORD was first placed on the market in India in September 1907, and continued to be marketed there until about 1940. The fact that this record label survived for over thirty years in India, is primarily due to the business acumen of several generations of the Ramchunder family of Bombay, whose association with the the marketing of musical instruments goes back to 1851. The business of S.B. Ramchunder was established in 1851 at 26 Kalbadevi Road, Bombay, as musical instrument suppliers, importers and repairers, with particular emphasis on the sales and maintainence of harmoniums, and as such S.B. Ramchunder was one of’ the first ‘native’ dealers in this field in Bombay. The business of S.B. Ramchunder had developed out of the musical ability of S.B. Ramchunder and his brothers, who were all harmonium players of repute and although being Hindu’s, they were often called upon by members of the Christian community and churches to perform at functions in and around Bombay. The Ramchunder brothers also had the support of a number of Maharajahs of the Princely states. After some time the name of the business was changed and Bros., as another of the brothers took over business, following the death of S.B. Ramchunder, who who were not old enough to asume responsibility business. T.S. Ramchunder is said to have been born in 1846, (although yet another report gives his date of birth as being on 4th May 1861) is said to have been taken into the family business then operating as B.S. Ramchunder and Bros., in 1881, and he was soon joined by at least a couple of brothers over the next few years. The year 1886 has been suggested as the year that T.S. Ramchunder along with his younger brothers took over the running of the family business from their elder relatives. The name of the family business was then changed to T.S. Ramchunder and Bros., while continuing to trade at 26 Kalbadevi Road, Bombay -2, this business was in the Dhobi Talao area, a locality that had developed over the years to become the centre of the musical instrument trade in Bombay. The proprietors of T.S. Ramchunder and Bros., to give their proper Hindu names were, Ramchunder Narrotam, Purshotum Narrotam and Jagjivan Narrotam, assisted by Shivshankar Ramchunder, Devidas Ramchunder and other staff. The family residence was at 40 Bhapu Khote Street, a side street leading off from the oiher end of Kalbadevi Road, near the Mumbadevi Temple. This residence also’served as an additional address of the business throughout the long history of the firm, but was mainly used for the building and repair of harmoniums. In Gujarati the title of the business is given as T.S. Ramchandra and Bros.
Another important aspect of the growing success of T,S. Ramchunder and Bros., was that the firm had close ties with most of the Parsi theatrical companies that were operating in Bombay in supplying the musicians who performed in the theatres with their instruments. The staging of Gujarati and Hindustani dramas and plays in the theatres of Bombay was at it’s zenith in the 1890’s and would in the years to come with the emergence of the ‘talking machine’ provide T.S. Ramchunder and Bros., with an abundant source of songs to record. Sometime between 1895 and 1897, T.S. Ramchunder and Bros., began to import phonographs, and before long a steady trade in Edison phonographs was being conducted. A novel approach to marketing the phonograph that was quite common in Bombay was to include a couple of cylinders of some ’eminent singer or songstress’ – which in the case of T.S. Ramchunder and Bros., was most likely a performer of Baliwalla’s Theatre, or the New Alfred Theatre Company, with which the firm had good connections. Several musical instrument dealers in the Kalbadevi Road had taken on the phonograph as a side-line, but soon found the increasing interest in such machines to be occupying more and more of their show-room space. As far as can be traced the first business to be specifically established as a ‘talking machine’ dealer was the Dadaphone Talking Machine Co., at 379 Kalbadevi Road, in 1899, and is believed to have been the first business to have dealt in disc talking machines as well as phonographs. With the increasing interest in ‘talking machines’ the musical instrument dealers of Bombay quickly adapted their businesses to cater for public demand for this new invention, and while the European operated musical instrument houses seemed content to concentrate on the sale of pianos and band instruments, the ‘native’ dealers had seized the opportunity of promoting the ‘talking machine’ with the James Manufacturing Coy., merchants and chemists of 104 Kalbadevi Road, who had opened a business in the name of the Edison Phonograph Depot, and T.S. Ramchunder and Bros., emerging as the most ‘up-to-date’ musical merchants in Bombay. By November 1903, Frederick William Gaisberg had arrived in Calcutta, to take recordings of Indian music for The Gramophone and TypeWTiter, Ltd., and succeeded in producing some 550 disc recordings for the company, which formed the basis of the company’s activity in India. In late 1904, John Watson Rawd, accompanying Stephen Carl Porter, the recording expert arrived in Calcutta to take recordings for Nicole Freres, Limited., Stephen Porter took recordings in Calcutta, Madras and Bombay resulting in a catalogue of some 600 disc records for the ‘Nicole Record’ label. Close on the heals of the Nicole recording tour of India came William Sinkler Darby who produced over 1200 recordings for The Gramophone and Typewriter, Ltd. While the ‘Gramophone’ and ‘Nicole’ interests were centered in Calcutta, other European recording companies began arriving in India to take sound recordings and found the ‘native’ musical instrument dealers of Bombay to be very eager to become a part of the sound recording industry. Heinrich Bumb and Wilheim Hadert, the ‘recording experts’ of tbe Beka Record, G.m.b.A., arrived from Berlin, during November 1905, and with the assistance of Valabhdas Runcbordas & Co., took some three hundred recordings in Bombay and Calcutta before proceeding onto Rangoon, Burma and other locations in Asia. From late 1905 to mid-1907, rumors had been circulating in the talking machine trade that a disc record pressing factory was being set up in Bombay, with the assistance of a German company. By October 1907, it had been confirmed tbat a small disc record pressing plant was operating three hand presses in a rented room in Kalbadevi Road, Bombay. The firm behind this disc record pressing plant was The Wellington Cycle Co., run by Rustomjee Dorabjee Wellington, and the discs being manufactured by the firm were issued on the ‘Singer Record’ label. The Wellington Cycle Co., 1 Churchgate Street, Fort, Bombay, also appears to have been linked to The James Manufacturing Coy., 103 Kalbadevi Road, Bombay, and although The James Manufacturing Coy., are known to have had some disc records manufactured for them by Beka Record G.m.b.H., Berlin, on the ‘James Opera Record’ label, by 1908, both The Wellington Cycle Co., and The James Manufacturing Coy., were sharing ‘matrix’ stocks on both the ‘Singer Record’ and the ‘James Opera Record’. 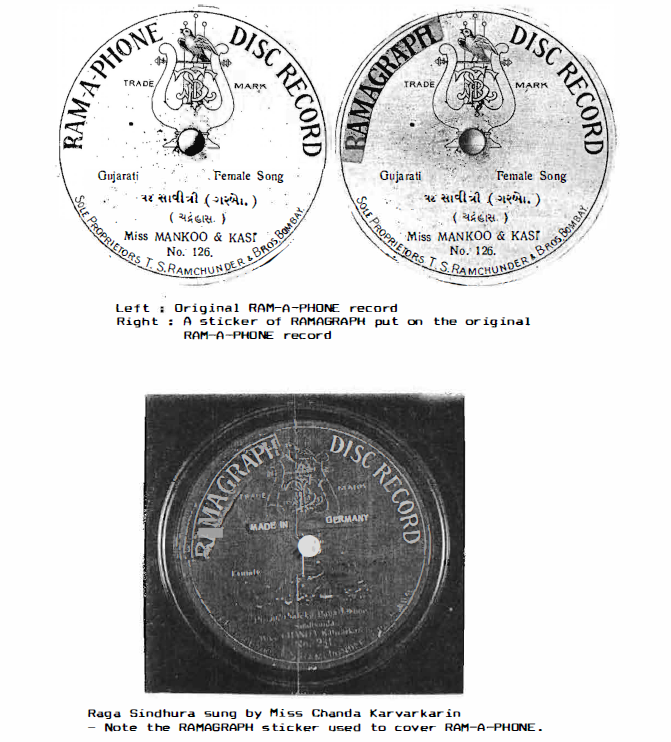 Along with the ‘Singer Record’ and James Opera Record’ the next label to appear on the market in India was the ‘RAM-A-PHONE DISC RECORD’ introduced by T.S. Ramchunder & Bros. These recordings had been taken by a recording expert of Lyrophon=Werke, Adolf Leiban & Co., Berlin, and manufactured at their pressing plant at Berlin. The use of the name ‘Lyrophon’ as a trade mark applied to phonographs and cylinders appears to have first been registered to the firm of Kolkow & Russ, Continental=Phonographen=Fabrik, Blucherstrasse 6, Berlin in April 1899. The German singer Adolf Leiban had established his own business in the name of A. Leiban & Company, Freidrichsgracht 58, Berlin, by February 1901, producing phonographs and cylinders. By November 1902, A. Leiban & Co., had produced a similar line of products with the registered trade mark of ‘Arion=Record’ followed by the Leiban-Record in March 1903. These products were supplemented by the introduction of a disc record in the name of ‘Lyrophon’ single-side recorded discs in 1904. For some reason the ‘Lyrophon’ trade mark by name was registered to one Ernesto Herrmann, Willdeno􀄮strasse 4, Berlin, in June 1907 as applied to the manufacture of talking machines and disc record, by which time there was a substantial catalogue of ‘Lyrophon’ labelled discs on the market in Europe. It seems that A, Leiben & Company had been re-formed in about December 1906 into Lyrophon=werke, Adolf Leiban & Co., and removed at about this time to their new premises at Gitschinerstrasse 91, Berlin. From late 1906 a􀅣d continuing into 1907 and some time beyond Frank Rauth, 9 Christopher Street, Finsbury Square, London, was the British agent for the ‘Lyrophon’ disc records, later moving to 27, 29 Worship Street, London. From about this time Lyrophon=werke, A, Leiban & Co., began a series of recording tours of Asia which included not only India but also into Burma, Siam, The Malay States, Inda-China, The Dutch East Indies, and China. By 1 November 1912, Lyrophon=werke, Adolf Leiban & Co., had been converted into a limited liability company in the name of Lyrophon=werke, G.m.b.H., under the proprietor, Martin Schulvater while still located at Gitschinerstrasse 91. By 1913, Lyrophon=werke, G.m.b.H., had been absorbed into the conglomerate of companies controlled by Carl Lindstrom, A.G., Berlin. This outline of the Lyrophon=werke, company is given simply to provide some background information to the manufacturers of the disc records for T.S. Ramchunder & Bros., between 1907 and 1912. As one of the premier musical instrument, phonograph traders and suppliers of Bombay, T.S. Ramchander and Bros., bad a good knowledge of the best ‘native’ talent, and had also planned to enter into the ‘talking machine’ industry. In late 1906 the recording experts of Lyrophon=werke, Adolf Lieban & Co., Berlin, arrived in Bombay to take recordings on behalf of some of the musical instrument and talking machine dealers. The German ‘Lyrophon’ company used a different tactic to most other recording companies by offering each business for whom the recordings had been taken to have the disc records issued on a label of their own choice and title. T.S. 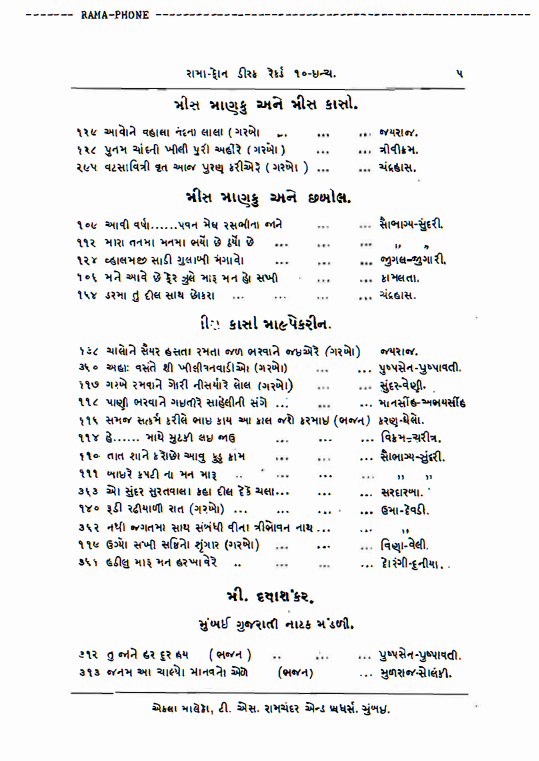 Ramchunder and Bros., had secured for the Lyrophon recording experts, singers of the highest calibre, including several associated with the New Alfred Natak Mandali, Mumbai Gujarati Natak Mandali, the Parsi Natak Mandali, and classical singers such as Miss Achhan Bai, and Miss Chanda Karvarkarin, and Mr. Muradali, the comic singer. The matrices of the recordings taken by the Lyrophon recording experts were taken back to Germany and from which pressings were manufactured at the Lyrophon=werke, located in a South-Western suburb of Berlin. The disc records manufactured for T.S. Ramchunder and Bros., appeared on the market in India – not as LYROPHON labelled disc records but with the label of – RAM-A-PHONE DISC RECORD. The label for the RAM-A-PHONE DISC RECORD had been designed by Ramchunder Narrotum’s son, Harishankar Rarochunder, (born 1887) who had joined his father in the business in 1905, as a ‘drawing master’. The design that Harishankar produced featured a lyre and a bird with the letters T.S.R. entwined within the lyre, and this basic design, with modifications, remained the ‘trade mark’ of the label throughout it’s entire life. The first catalogue of RAM-A-PHONE DISC RECORD was published in September 1907, and listed some 420 recordings – all single-side recorded discs, of which all but 23 discs were 10″ inch size, the remainder being 8″ inch discs which were mainly repeat recordings of titles in the 10″ inch size. The numerical sequence and matrix numbers of the discs were the same beginning at 100. Thus the first catalogue number was 100 with a matrix number of lOOi. The disc records of Miss Achhan and some of those of Miss Chanda Karvarkarin were given special red labels with black lettering and sold for 3 rupees, while the other recordings had black labels with gold printing and were offered at 2 rupees and 8 annas. The 8″ inch discs were offered at l rupee and 8 annas. The European ageots for T.S. Ramchunder and Bros., between about 1897 and up to 1908 were William Meyerstein and Co., of 6 Lloyds Avenue, London, E.C., merchants, importers and exporters of general merchandise, with marketing contacts in Australia, China and Japan as well as India, and it most likely that William Meyerstein and Co., were commissioned to acquire the necessary recording machines and equipment needed for T.S. Ramchunder and Bros., to undertake their ‘own’ recordings. Although the recording experts of the Lyrophon= werke, Adolf Lieban & Co., Berlin, had taken the first four hundred recordings to be issued on the RAM-A-PHONE DISC RECORD label, this arrangement seems not to have been repeated as the next series of recordings were taken by T.S. Ramchunder and Bros., using their own recording machine under the supervision of Shivshankar Ramchunder, a close relative of the Narrotam brothers, and assisted by Harishankar Ramchunder. They were later joined by Narayandas Purshotam, the son of Purshotam Narrotam, in about 1909. While the actual recordings were taken by T.S. Ramchunder and Bros., at Bombay, the matrices were shipped to Lyrophon􀀯werke, at Berlin, S.W. for manufacturing disc pressings. For the 1908 season, there was a slight change in the label name of the disc record. The change of the label name from RAM-A-PHONE to RAMA-GRAPH is believed to have been brought about by an action against T.S. 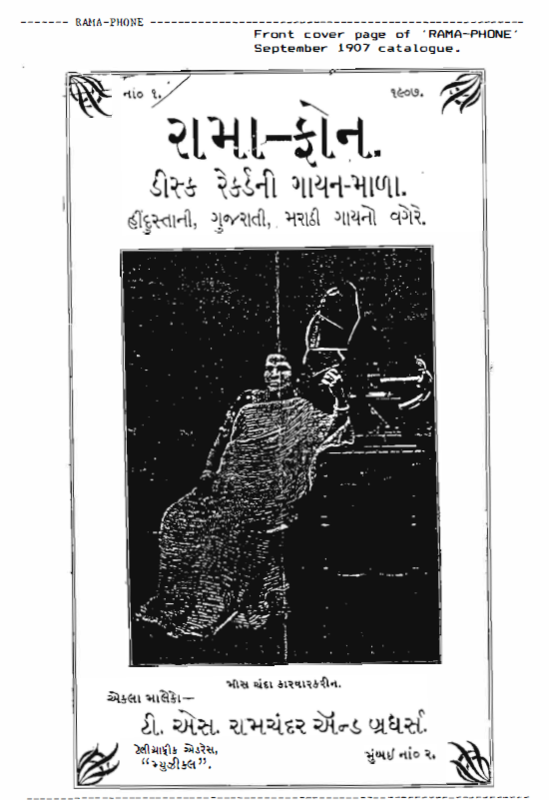 Ramchunder and Bros., by The Gramophone Co., Ltd., in India, over the use of the wording RAM – A – PHONE and it’s similarity to the word GRAMOPHONE which The Gramophone Co., Ltd., claimed was the word used to identify their products only. The first pressings of RAM-A-PHONE disc records had plain reverse sides with only the words ‘Made in Germany’ – but later pressings of the discs have an embossed design reading “RAMAGRAPH” RECORD surrounding the trade mark and the words ‘Trade Mark’ across the spindle hole, along with small illustrations of a talking machine and disc, and the words ‘Made in (above) and Germany (below). Some copies of single-side recorded discs have been found with RAM-A-PHONE DISC RECORD labels – but with “RAMAGRAPH” RECORD” backs, and other copies with the word ‘RAM-A-PHONE’ pasted over with ‘RAMAGRAPH” – also with the “RAMAGRAPH” RECORD back. From catalogue number 521 onwards all “RAMAGRAPH” DISC RECORD releases were double-sided, and those titles from the earlier releases formerly pressed as single-side recorded discs which had remained popular were re-released as double-sided discs under the new label name. The matrix series utilized for the earlier releases have the matrix number suffixed by …. 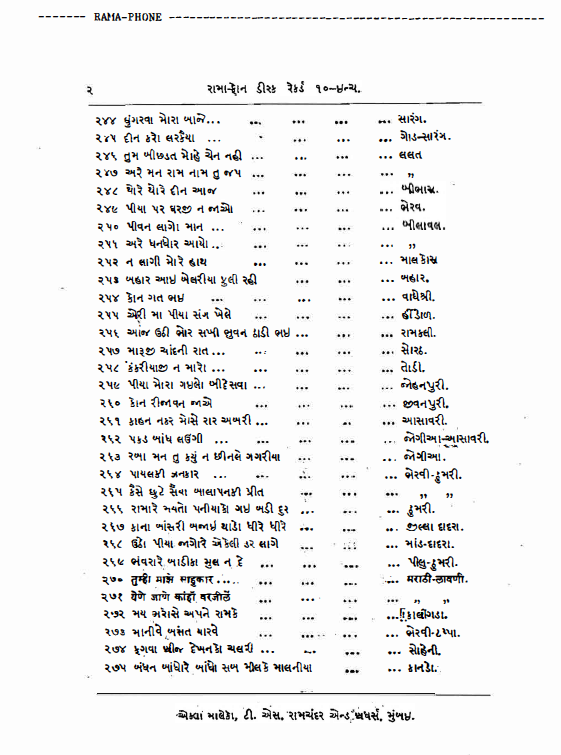 … i, while other matrices have a suffix of …….ind, or ……..IND, but the significance of this variation is not understood except that it seems to identify recordings taken in India. In May 1908, The Gramophone Co., Ltd., began the manufacture of disc records from it’s factory at 139 Beliaghata Road, Sealdah, Calcutta, and soon became the driving force of the sound recording industry in India. The market for disc records in India had grown dramatically over the past few years and several, mainly German based recording companies continued to have a presence in India, but without disc record pressing facilities in the region they offered little competition to the resources and might of The Gramophone Co., Ltd. In June 1908, The Gramophone Co., Ltd., issued a circular to all their competitors in India, warning these firms that the company would not hesitate to adopt legal proceedings against these companies, if they ttempted to induce, an artist, named Mohamed Hussein, to make recordings for their labels. In fact Mohamed Hussein had already provided these rival labels with recordings. In April 1908, Mohamed Hussein had made a number of recordings for T.S. 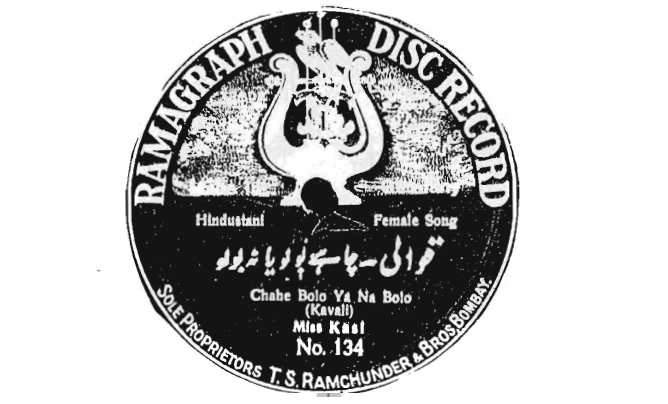 Ramchunder & Bros,, and several of these recordings were placed on the market in India in September 1908, on the RAMA-GRAPH DISC RECORD label. The various court actions were eventually settled in early 1910, however the recordings of Mohamed Hussein (and other variations in the spelling) continued to appear in the stores, and through the talking machine traders in the bazars, which suggests that The Gramophone Co., Ltd., had not entirely succeeded in having the discs banished from the market. In 1909, B.S. Lloyd and Co., 40 King Street, Cheapside, London, E.C., and with an Indian branch office at 44-48 Churchgate Street, Fort, Bombay, became the new European shipping agents for T.S. Ramchunder and Bros., and up to 1912, the matrices were still being sent to the Lyrophon=werke, at Berlin for commercial pressings. The “RAMAGRAPH” DISC RECORD was recorded and marketed specifically for the market in Bombay, and despite being manufactured in Germany, did not seek to broaden it’s appeal beyond that territory. 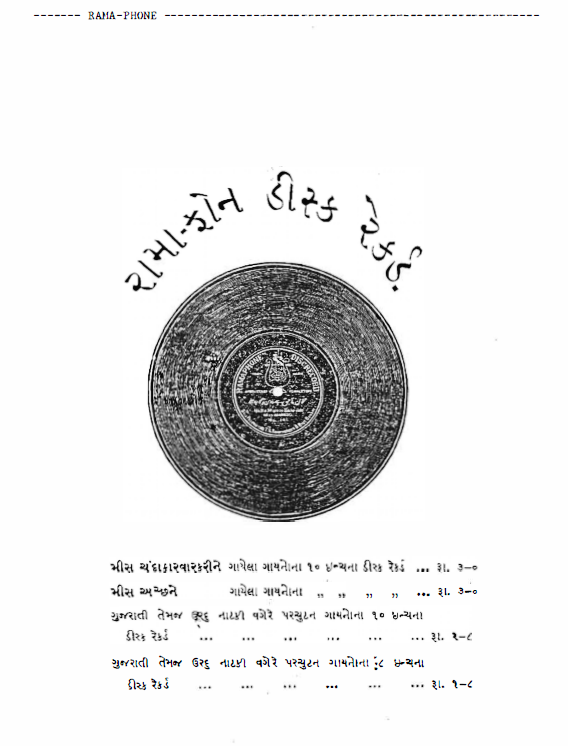 The recording program and releases on this label were slow but steady, and had remained within the confines of Western India, particularly reflecting the musical tastes of the Gujarati, Hindustani and Marathi speaking people in Bombay itself, making no attempt to extend to Central, Northern or Southern India. This total represents the ‘live’ catalogue of ‘RAMA-GRAPH’ recordings that were still in manufacture at the time – a number of titles having been already deleted from the catalogue. The ‘Lyraphon’ label was represented in Asia by only 152 – Burmese recordings. Between 1911 and 1912, the known number of releases on the RAM-A-PHONE DISC RECORD and “RAMAGRAPH” DISC RECORD, extended to about 800 titles. At some stage other numerical series were introduced in the 1000 series with black labels, and the 2000 series with navy labels, and a further series in a 3000 numerical block, but it is not known when these series were first issued. In 1912, a boycott of German manufactured goods imposed by the Government authorities in India, had the general effect of dissuading German record companies from active participation in the sound recording industry of India, but as T.S. Ramchunder was in charge of it’s own recording programs the business continued much as it bad done so over the years. A more significant effect on the marketing of “RAMAGRAPH” DISC RECORD labelled discs was that on 1st November 1912, Lyrophon=werke, Adolf Lieban & Co., 91 Gitchinerstrasse, Berlin, was converted into a limited liability company in the name of Lyrophonwerke, G.m.b.H., the ‘new company’ having retained all the staff of the old company but with Herr Martin Schulvater, of Berlin becoming the sole director of the new company. Soon after, the company was merged with the Dacapo Record Company and by December 1913, and relocated to Grosse Frankfurter Strasse 137, Berlin, with Messrs Bruno Borchardt and Sigismund Salomon, of Carl Lindstrom, A.G., being named as managers, as both the ‘Lyrophon’ and ‘Dacapo’ companies along with other recording companies had been amalgamated into the Carl Lindstrom, A.G., Berlin, conglomerate of companies. 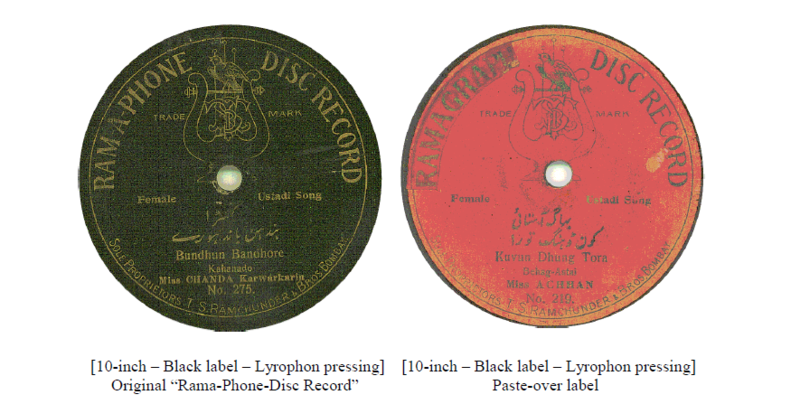 During the later half of 1913, Lyrophon=werke, G.m.b.H., Berlin, had been offering to manufacture the ‘Most Up-to-date’ disc records for export to clients, including titles in the Bengali, Hindi, Tamil languages and recordings of Koran recitation, along with recordings in other Asian and ‘oriental dialects’. The origin or earlier issue of these recordings has not been verified, but it did not interfere with T.S. Ramchunder and Bros., who despite having reduced their number of releases to a trickle, continued to have their “RAMAGRAPH” DISC RECORD manufactured in Germany. During the war years from 1914 to 1919, although continuing their business of musical instrument dealers, the “RAMAGRAPH” DISC RECORD label though not in-active, had become virtually dormant, and appears to have made no new recordings during those years, relying simply on the servicing of it’s back catalogue. Mr. T.S. 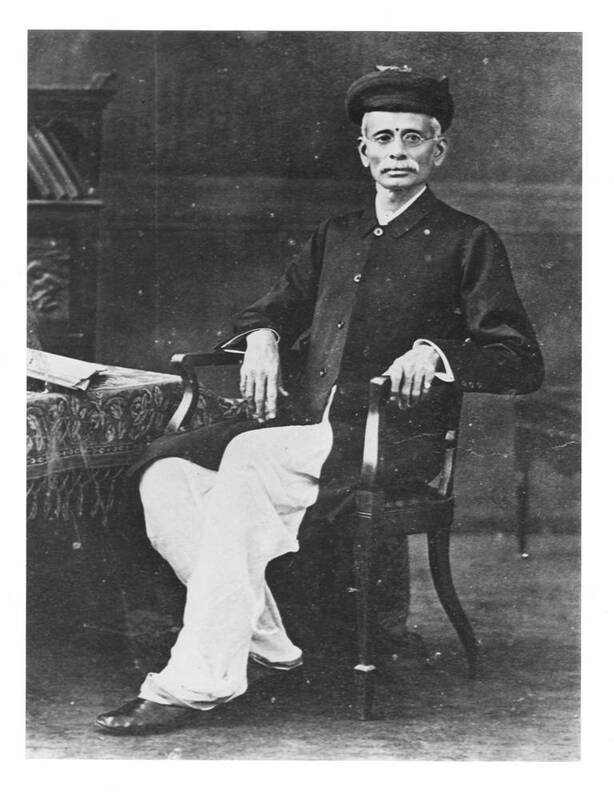 Ramcnunder (Narrotam) passed away on 6 April 1922, aged in his mid-70’s, where upon the direction of the business appears to have become the responsibility of Shivsbankar Ramchunder, but continued under the name of T.S. Ramchunder and Bros. Soon after the death of T.S. Ramchunder, the disc record and talking machine side of the business was re-vitalized with the introduction of the “Ramagraph” and “Ramola” talking machines, under the direction of Chhabil Das, who managed the talking machine side of the business. Apart from the ‘RAMAGRAPH DISC RECORD’ – T,S. Ramchunder & Bros., also marketed a line of Swiss-made talking machines in the names of “RAMAPHONE” for tbe more expensive models and “RAMOLA” for the cheaper models. To date no catalogue of the talking machines models has been found to verify the details of these machines. 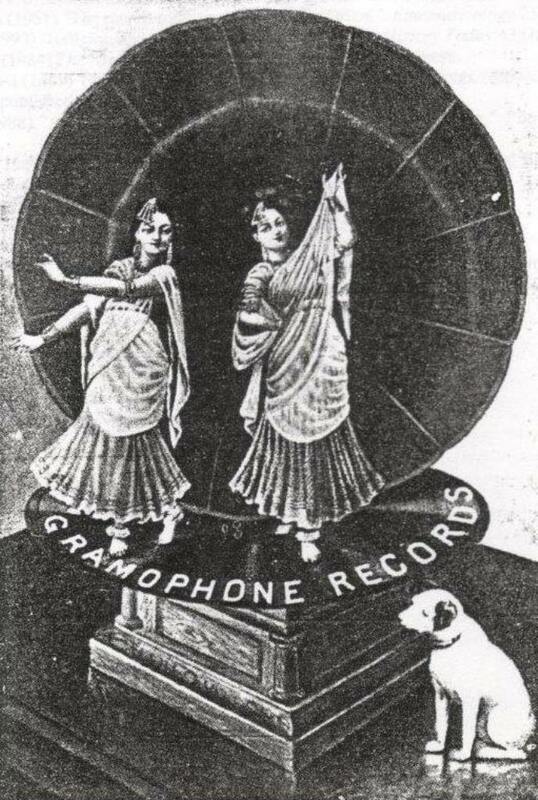 By the mid-1920’s the sound recording industry had become dominated by The Gramophone Co., Ltd., whose record labels, HIS MASTER’S VOICE, and the ZONOPHONE RECORD, virtually monopolized the Indian disc record market, with only slight competition from Valabhdas Runchordas’ company – The Viel-o-phone Co., Ltd., at Mahim, Bombay, who was pressing VIEL-0-PHONE and PHON-0-PHONE labelled disc records, along with distributing what ever stocks he might have had of ODEON RECORD or BEKA GRAND RECORD’s. 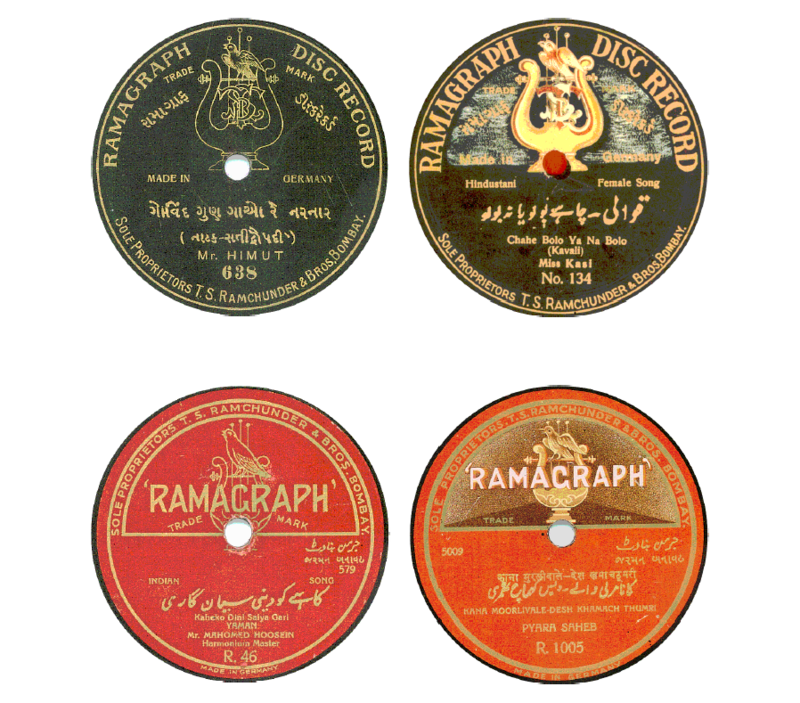 Besides the ‘Gramophone’ and ‘Viel-o-phone’ companies labels, there was only the “RAMAGRAPH” DISC RECORD still being produced for the record buying public in India. Although T.S. Ramchunder and Bros., was a very minor player in the field of sound recordings in India – it had survived, and renewed it’s interest in the disc record market by the introduction of a new dark-red “RAMAGRAPH” label. The disc record catalogue was re-activated by the introduction of a new red label with the simplified label name of “RAMAGRAPH”, The numerical series of the new red coloured “RAMAGRA.PH” discs began at R-1, and were little more than re-releases of previously issued titles, many dating back to 1907, and were thus ‘acoustic’ recordings that were in the main up to fifteen years old. 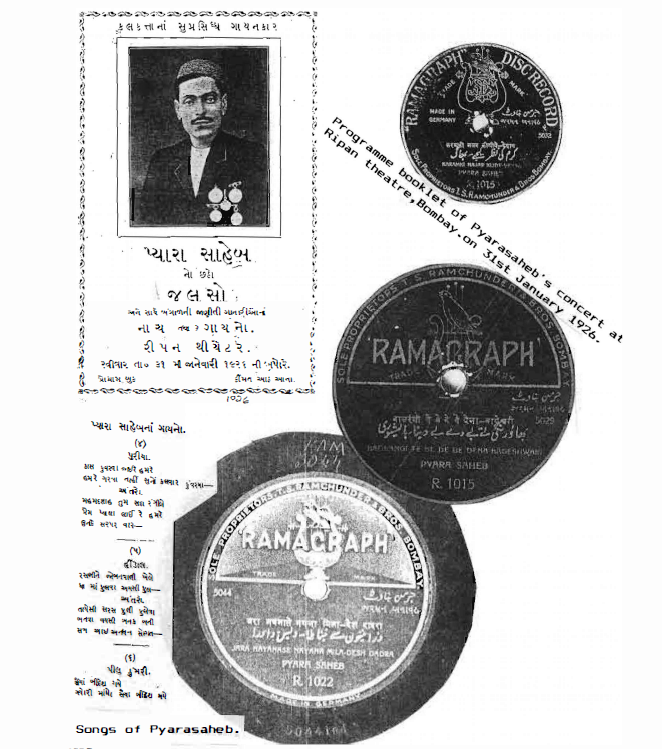 In May .. 1926 when Valabhdas Runchordas was in the process of setting up his disc record factory in Mogul Lane, Matunga, Bombay, he had offered to manufacture the “RAMAGRAPH” disc record at the new factory, however Chhabil Das, preferred the German pressings and continued to have the matrices sent to Germany for reproduction. There may have been some limited pressing work done by The Veil-a-phone Co., Ltd., for ‘RAMAGRAPH’ as some pressings of this time have a certain ‘gritty’ appearance – which is often seen with ‘Veil-a-phone’ pressings – however – all ‘RAMAGRAPH’ pressings indicate that they were ‘Made in Germany’. During 1927, T.S. Ramchunder & Bros., had made recordings of Gur Tikam Das of Shikarpur (Sindh), Chiman Lal of Gujarat and Seth Sobhraj, a Sindhi singer of repute. These artists were paid cash and expenses for their recordings and also given musical instruments. T.S. 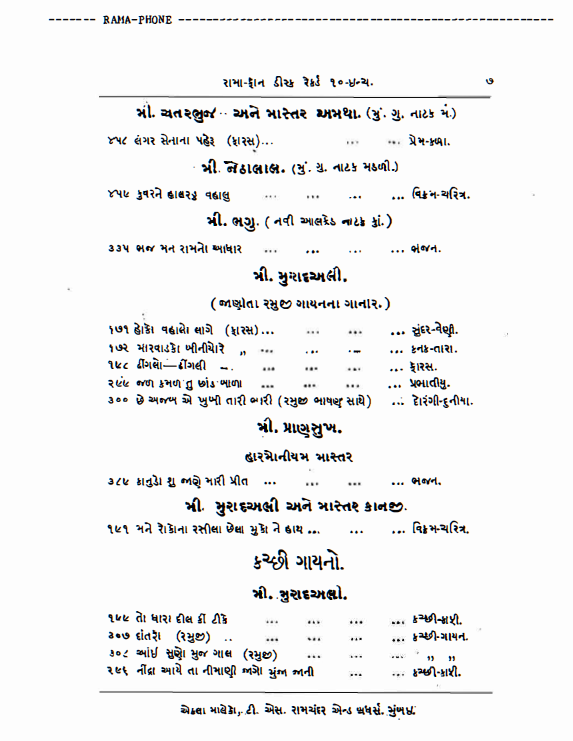 Ramchunder & Bros., continued to haye a good reputation for the harmoniums that they made, and promoted these· instruments by sponsoring public concerts of Pyara Saheb and Mohamed Hussain, both of whom were ‘gramophone celebrity’s of long standing and sure to draw large audiences to their concerts. In 1927, the first of the ‘electric’ recordings on the RAMAGRAPH label appeared – but up to this point all recordings that had been issued on the RAM-A-PHONE DISC RECORD, RAMAGRAPH DISC RECORD and RAMAGRAPH labels had utilized single-face numbers with the same number used for the matrix number. The introduction of the ‘new’ series beginning at R-1 had not changed that procedure, ·but with the introduction of ‘electric’ recordings the sequence of matrix numbering was broken up into ‘blocks’ which seem to have been used solely for the small number of recording artists that T.S. Ramchunder and Bros.1 engaged to make ‘electric’ recordings for the RAMAGRAPH label. These numerical ‘blocks’ begin with a series at 2000 – and included in the R- series from about R-140. The first of these ‘electric’ recordings are identified by a small ‘star’ [*] embossed in the label 1 and this ‘star’ device often seem on disc pressings of several makes of pressings that were manufactured by Carl Lindstrom, A.G., Berlin, at the Odeon-werke, Weissensee, Berlin, is believed to be a means of identification of early ‘electric’ recordings pressed by the Odeon-werke, but but utilizing the ‘electric’ recording method of Carl Lindstrom, A.G. The matrix series for subsequent recordings are prefixed ‘RAM-‘ for a general series of recordings, and issued in the R- catalogue series. There is little doubt that T.S. Ramchunder and Bros., had their own ‘electric’ recording machine and that these recordings were taken in Bombay without the assistance of support of any outside recording company, and as the company had been accustomed to sending their matrices to Germany for the manufacture of commercial pressings, this procedure was maintained, with the printed labels stating that they were ‘Made in Germany’. 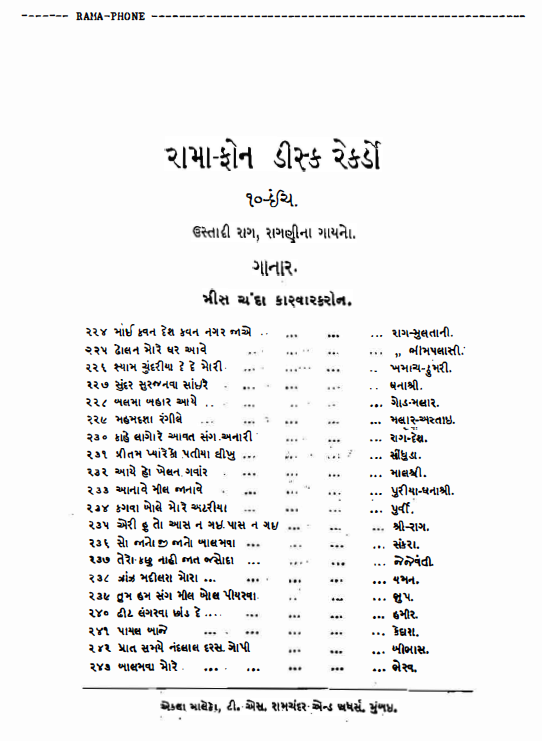 The RAM-5000 matrix series was reserved for recording of Pyara Saheb, who had been making recordings for several companies since 1904, and also made cylinder recordings for H, Bose”s Records even earlier. The RAM-5000 matrix series of recordings by Pyara Saheb, was curiously duplicated by The Gramophone Co., Ltd,, in launching their ‘TWIN’ record label in 1928, and it is interesting to note that the whole RAMAGRAPH – R-1000 series was issued on the ‘TWIN’ label song for song, coupling for coupling, and that these ‘Gramophone’ recordings were also repeat recordings of discs that Pyara Saheb had been making over the past couple of decades. The RAM-6000 matrix series was reserved for recordings by Mr, Valavalkar, of songs from Marathi dramas, and issued in a separate R-900 series. There may have been other series as well but the details of such series are as yet unknown. From this point onwards T,S, Ramchunder and Bros., appear to have taken no further recordings, even though they continued to sell disc records on the RAMAGRAPH label. The up-surge in new recordings offered by The Viel-o-phone Co., Ltd., and T.S. Ramchunder & Bros., was a cause of great concern for The Gramophone Co.; Ltd., particularly in that many of the competition records were of important artists, that had been on The Gramophone Co., Ltd’s catalogues for a long time. To combat this rise in competition, The Gramophone Co., Ltd., proposed to launch a cheap-priced double-sided disc under the label name of ‘CINCH’ a label that had previously been used for a short time in 1914, for a limited series of reissues of recordings by Mohamed Hussain. During 1927 it was decided to name the label ‘THE TWIN’ and to distribute these discs through a subsidiary company in the name of The Twin Record Co., Ltd., Calcutta. The launch of ‘THE TWIN’ record label in December 1927 by The Twin Record Co., Calcutta, began with red labelled discs starting at T-151, and featured reissues of recordings by Mohamed Hussain and Seth Sobhraj in competition with similar couplings reissued on ‘RAMAGRAPH’ and a selection of titles by popular ‘gramophone’ artists – under pseudonyms also in competition with recent issues on both ‘RAMAGRAPH’ and ‘VIEL-0-PHONE’. The original T- series of red labelled releases on ‘THE TWIN changed to yellow labels and the new series letters – FT-198, issued in October 1928, however the actual duplication of song titles continued up to FT-208 issued in December 1928. In about 1930, while the musical instrument repair business was still carried on at 40 Bapu Khote Street, T.S. Ramchunder and Bros., re-located from the building known as Bharat Bhuwan at 26 Kalbadevi Road, where it had been situated since 1851, to Kishore Building, 523 Kalbadevi Road, at the corner of Jamboolwadi Lane, almost opposite their old address. 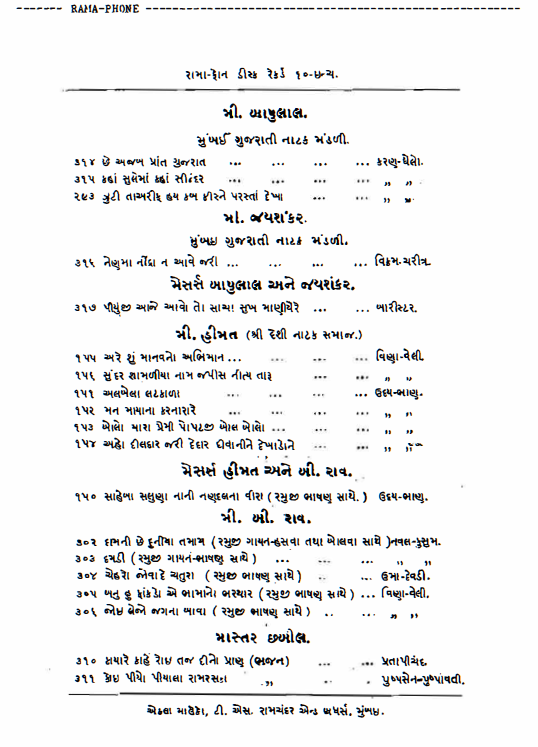 It is not known when the brothers Purshotam and Jagjivan Narrotam retired from the business, nor when Shivshankar Narrotam might have given up his position as director of the firm’s affairs, but from about 1931 the direction of the business came under the control of Narayandas Purshotam who had been with the firm since about 1909. An indication that there had been a change in the proprietor-ship of the firm is indicated by the fact that from 1933 onwards the name of the firm was often given under the title of T.S. Ramchunder and Co., as distinct from … and Bros. The Narrotom family were said to have been well liked and respected, particularly amongst the Parsi community, and that their association with the musical and theatrical life of Bombay had provided them with an easy going and af􀄒luent life-style. The coming of motion pictures in the 1930’s had a dramatic effect on the continuity of Gujarati and Hindustani theatres in Bombay. Several of the theatres in the Falkland Road area were faced with hard times, and T.S. Ramchunder & Bros., business was also effected. Over the past few years there had been many changes in the corporate structure of the sound recording industry in Europe, and possibly the most profound change that had taken place which had a direct bearing on the activities of T.S. Ramchunder and Bros., was the merger of The Gramophone Co., Ltd., and Columbia Graphophone Co., Ltd., into the formation of Electric and Musical Industries, Ltd., (E.M.I., Ltd.,) incorporated on 20th April 1931. Columbia Graphophone Co., Ltd., had acquired the controlling interest in Carl Lindstrom, A.G., Berlin, conglomerate of companies in October 1925, which does not appear to have had any direct effect upon the pressing of the RAMAGRAPH disc records. The merger of the ‘Gramophone’ and ‘Columbia’ companies was another matter entirely, for it would have meant that T.S. Ramchunder and Bros., would have had to turn to ‘Gramophone’ interests to have it’s disc records pressed, a proposal that they had resisted for about twenty five years. In about 1933, a new design was given to the RAMAGR.APH label, with a red and brown colour, overprinted in gold, which was basically a modified and prettier version of the R- series type of label. The ‘new design, label presented no new recordings and was used for re-pressings of titles that had retained their popularity over the years. These discs were also made in Germany, and it is presumed that they were manufactured by a pressing plant within the E,M,I., Ltd., conglomerate of companies, if not by Carl Lindstroem, A.G., at their Odeon-werke, Berlin. By 1936, the new design RAMAGRAPH label appears to have gone into a state of relapse once again and to have not released or re-issued any more titles, and by 1938 had little more to offer it’s customer for disc records, other than left over stocks, of the variety of label styles that T.S. Ramchunder had marketed over the past three decades. In 1939, the Kishore Building at 523 Kalbadevi Road, that had been occupied by T.S. Ramchunder and Bros., since 1931, is reported to have either collapsed or burnt out, forcing the business to be re-located yet again, this time back across the road to Fram Mahal, 526 Kalbadevi Road, whicb was in fact only a couple of doors from their former address at number 26, due to the re-numbering of allotments on Kalbadevi Road. In about 1943, T.S. Ramchunder and Bros., vacated the premises at Fram Mahal, and under direction of Narayandas Purshotam operated the business solely from the family residence at 40 Bapu Khote Street, where it lingered on for a few more years, basically attending to repairs of musical instruments and clearing out left over stocks. Although the firm of T.S. Ramchunder and Bros., had failed to survive a century of business activity, there had been at least three generations of the family that had steered the firm through the vicissitudes of several decades of change, both in public taste and the precarious hopes of the sound recording industry, which is witness to a far greater number of business failures than successes. The achievement of T.S. Ramchunder and Bros., in surviving in the sound recording industry of India for over three decades is no small achievement in itself, particularly in that the musical tastes of the record buying public were constantly changing – an aspect which the T.S. Ramchunder and Bros., seemed to be able to cope with, but curiously, the firm never took advantage of disc record pressing facilities in India, for the RAMAGRAPH discs were never manufactured in India during their entire life-span, and always dependent on resources and facilities outside of India. During the 1930’s The Gramophone Co., Ltd., opened up it’s record pressing factory at Dum Dum, to virtually every record company or label operative in India and Asia, and were keen to dissuade any other sound recording company or investors to challenge their monopoly in disc record pressing. This opening up of custom record pressing for ‘private recorders’ also provided The Gramophone Co., Ltd., with a knowledge of the interests and marketing abilities of nearly all other record companies in India and Asia. By the mid-1930’s the only record companies operating in India who were not having their discs manufactured by The Gramophone Co., Ltd., were The Musical Products Ltd., Madras, with the BROADCAST label, manufactured by The Crystalate Gramophone Record Manufacturing Co., Ltd., in England; the PRABHAT record of the Prabhat Film Company, Poona, whose half a dozen disc records were manufactured in Germany by Telefunken A.G., Berlin. and also T.S. Ramchunder and Bros., Bombay., with their RAMAGRAPH records being manufactured in Germany by Odeon-werke, Berlin. In 1935 Duleria A. Pandya established The National Gramophone Record Manufacturing Co., Ltd., at Wadala, Bombay, with machinery and assistance from Japanese suppliers. The ‘National’ factory also offered custom pressing facilities and manufactured disc records for several clients in Bombay. As T.S. Ramchunder and Bros., had been taking their own recordings in Bombay since 1908, and certainly up to 1927, and were therefore not dependent on foreign or ‘other’ corporate interests, the survival of the RAMAGRAPH label might have been more efficiently accomplished by utilizing facilities within India. The RAMAGRAPH label might have been gradually becoming out-dated, but the facilities open to the label in India during the 1930’s might well have re-vitalized it’s presence in the market for records in Bombay at least. Considering that aspect it is puzzling why they preferred to have their pressings manufactured in Germany. In recent times the presence of T.S. Ramchunder & Bros., although completely gone from the talking machine trade could still be seen in the Kalbadevi Road, in a small musical instrument store operated in the name of -M.C. Ramchunder, 454 Kalbadevi Road, Bombay, where Shri Ramchunder Narrotum’s garlanded portrait could been seen proudly displayed. 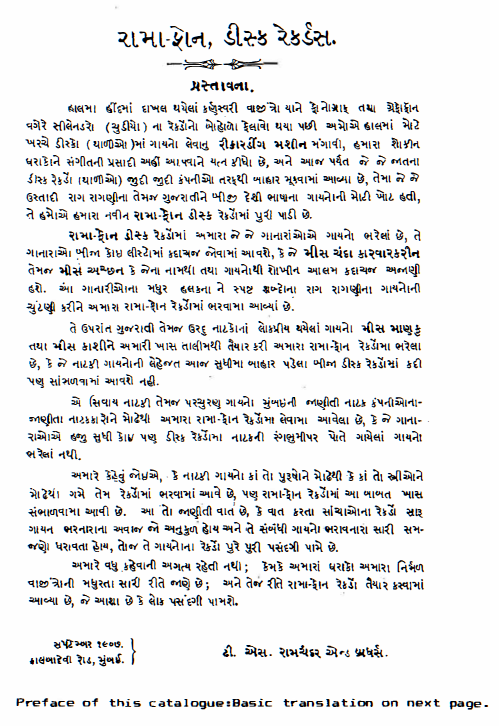 My thanks are especially due to the late Harishankar Ramchunder and also some of his descendants, and M.C. Ramchunder and Manu C. Wadawala, for assistance and information provided. I would also like give special thanks to Juzer T, Varawala, Suresh Chandvankar, R,K, Talekar, Narayan P. Mulani, Prabhakar Datar and Krishnaraj Merchant, for further information and record data. Thanks are also due to EMI Music Archives, for their permission to use certain documents relating to this article. The above article is a greatly expanded and modified version of my article – ‘Ramagraph’ – published in The Talking Machine Review International, Bournemouth, (pages 1903-05) No. 69. December 1984. The original ‘RAMA-PHONE’ catalogue of September 1907, is reprinted here in it’s entirety, revealing the depth of repertoire on the label, and also that it includes recordings by a number of important recording artists whose recordings on labels such as ‘Gramophone’ – ‘His Master’s Voice’ – ‘Zonophone’ – and other labels are more widely known that the ‘RAMAGRAPH’ issues. The catalogue contains releases by Murad Ali, Pransukh, Bhagoo and Himat (Bhai), all of whom had long and successful careers. Of equal importance to record collectors are the recordings of Miss Chanda Karwarkarin (whose picture adorns the cover) – sometimes referred to as Miss Babli Ba􀁛. Although open to debate, Miss Chanda (Babli Bai) is said to have had an early influence on Keserbai Kerkar. These ‘Female Ustadi’ songs reveal – Miss Chanda – to be an artist of exceptional merit, and it surprising to find that these recordings are tbe only known issues of this fine classical artist. Beyond the original catalogue are the recordings of Mohamed Hussain, Peara Saheb, Seth Sobhraj and Mr. Valavalkar and others, which are all treasured by collectors. “RAMAGRAPH” disc records are still found in the bazars and junk-shops today, but sadly most of this treasure is being lost to history as time goes by. ‘RAMAGRAPH’ disc records have not been on the market since the 1930’s and certainly none of these important recordings have been reissued in modern times. You will not find our singers elsewhere like Miss Chanda Karwarkarin and Miss Achhan, who are popular concert performers. We have recorded songs from these singers and issued them here. 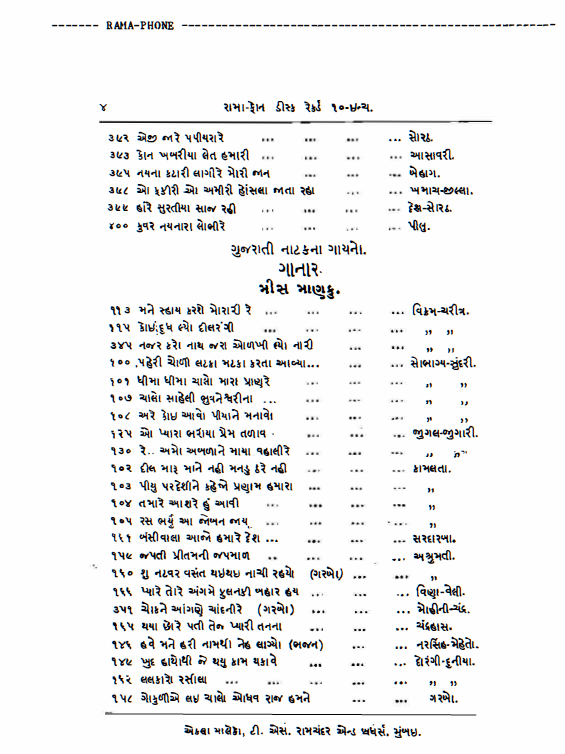 In addition to these, we have Gujarati and Urdu Drama songs recorded by us with special training given to the singers, which you will not find in any other records. 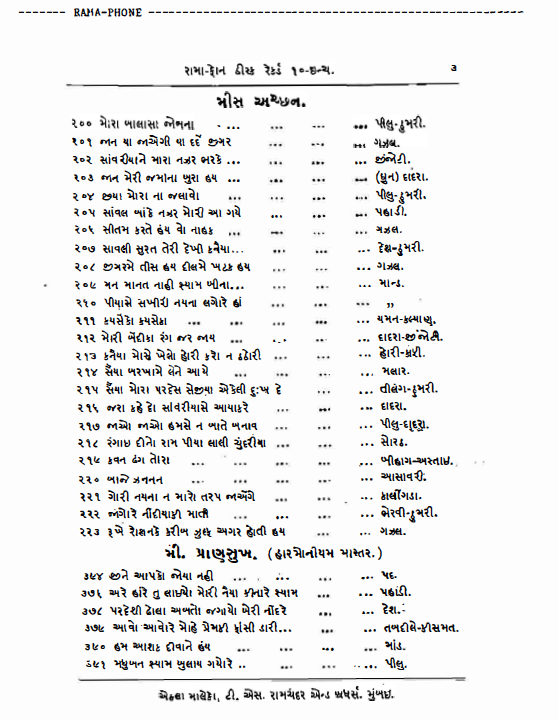 Drama and other songs from the famous Gujarati Natak Mandali, are also recorded in their own voices, which have not even been presented by them on the stage. We have record’ed these songs with maximum effort and taken care about the male and female voices. We do not have to speak further, because our clients know about our good quality musical instruments, and the recording in RAM-A-PHONE records. We hope our clients will like these selections, and that they will become more popular. This entry was posted in INDIA and tagged Adolf Leiban & Co, Cinch Label, Lyrophon=Werke, Nicole Record, Ram-a-Phone Disc Records, Ramagraph, Ramagraph Disc Record, S.B. Ramchunder, T.S. Ramchunder, The Gramophone Company, the james manufacturing coy, The Twin Record Company, the wellington cycle co, Valabhdas Runchordas by bajakhana. Bookmark the permalink.